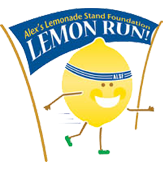 Alex's Lemonade Stand Foundation's 5th Annual Lemon Run Philadelphia 5K Run/Walk and Kids’ Dash presented by Volvo will be held on Sunday, November 10 at Memorial Hall in Fairmount Park. The Lemon Run raises funds and awareness for childhood cancer. The Lemon Run is a fun way for 2,000 runners and walkers, including several childhood cancer heroes and there families, to get involved in Alex's Lemonade Stand Foundation’s quest to find better treatments and cures for all kids with cancer. The Kids’ Dash (100 meters for children 10 and under) begins at 8am and the 5K Run/Walk (3.1 miles for runners and walkers) begins at 8:30am. You can participate as a virtual runner if you aren't in Philadelphia on November 10. Supporters from across the country and around the world will run or walk their own 5K on the day of The Lemon Run.